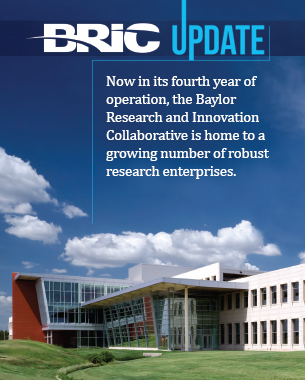 Now in its fourth year of operation, the Baylor Research and Innovation Collaborative is home to a growing number of robust research enterprises. The collaboration between Baylor mechanical and electrical engineering researchers and aerospace giant L-3, the first corporate BRIC partner, has produced a patented non-destructive inspection system for carbon fiber composite components and a highly effective prototype HDMI wireless airborne system. Baylor’s partnership with Education Service Center Region 12 and architecture firm Huckabee, Inc., has produced its first sets of research data from surveys of teachers who participated in professional development workshops conducted in the 5,000 square-foot LEx Labs. Researchers from CASPER conducted the research study, which was funded by both Region 12 ESC and Huckabee. Six-year-old technology services and engineering company Birkeland Current continues to be an integral contributor to the composite materials non-destructive inspection project between Baylor and L-3. Birkeland is co-recipient with PRUF Energy Solutions of the 2015 Business Innovator Award from the Greater Waco Chamber of Commerce. The award recognizes the partnership for their jointly developed wireless, autonomous energy monitoring, tracking and control system. The BRIC quickly acquired a reputation as a go-to site for successful seminars, lectures, and other forums for the free exchange of ideas. Since its opening in 2013, the BRIC has played host to over 12,000 attendees at 600 academic, business and community events. Recent gatherings included a breakfast for BRIC community partners, technology business briefings sponsored by Chamber of Commerce officials and lectures by an active NASA astronaut and a noted mathematics educator.